I typically use two oils for my hair; I use coconut oil and argan oil. I use both oils interchangeably for dressing my hair, hot oil treatments, hair growth treatments and conditioning my hair. "ActuallyOrganic" is a brand that produces Pure Moroccan Argan Oil. I have been using their argan oil for a while now, and I love the results I noticed for my hair and skin. Pure Argan Oil has been the rage for some time now, and you can find it as an ingredient in both skincare and haircare products. Argan Oil is known to be incredibly nourishing and hydrating. Argan Oil is from Morocco. They produce it from the kernels of the argan fruit. They extract the oil from the argan kernels. They first dry the argan fruit to remove the kernels. They remove the fleshy pulp, and then the argan nut is cracked to remove the kernels. They gently roast the seeds, and after roasting, they allow the kernels to cool down. After the cool down process, they grind the kernels and press them to get the pure, unfiltered argan oil. Seems like an easy process, right? Argan oil is rich in fatty acids, Vitamin E, Vitamin A, and antioxidants. 1. Fatty acids: Have inflammatory properties, which can help to open the hair follicles, promoting healthy hair growth. 2. Vitamin E: Vitamin E works to combat the free radicals that cause wrinkles on the skin. Using Vitamin E prevents the formation of wrinkles by blocking free radicals damage. It treats wrinkles by boosting collagen production, a connective tissue that keeps the skin elastic. 3. Vitamin A: Vitamin A is essential for the proper cell growth, which directly influences hair growth. It also helps to produce that natural oil our hair needs also known as sebum. 4. Antioxidant: Antioxidants protect the skin by limiting the production of free radicals. Free radicals can damage your skin cells. Antioxidants help to prevent and repair damage to your body's tissue. It contributes to reducing the signs of aging. How awesome are all these benefits argan oil has to offer? I love how versatile the argan oil is, and the fact that you can use it on your skin and hair. 1. Using argan oil as a heat protectant before you use a blow dryer or straightening iron. 2. Argan oil is used to reduce the appearance of acne scars. 3. Argan oil serves as a good moisturizer; you can use it as a body and face oil. 4.Argan oil is great in repairing damaged hair. You can use it as a hot oil treatment to help condition your hair. 5. Massage a few drops into your hair and massage to help stimulate hair growth. According to Actually Organic Company, their Pure Moroccan Argan Oil is sourced from the very best. They pride themselves on delivering organic, and the highest quality and most potent oils. This argan oil is amazing. My first impression after using it on my skin is "wow I love how it feels on my skin, and how quickly it absorbs into my skin." It is not thick and does not leave any residue or sticky feeling on my skin. It is very hydrating for my skin. 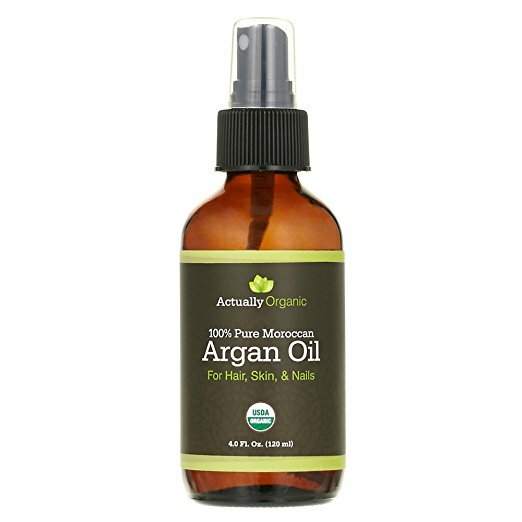 "ActuallyOrganics" Argan oil is light enough to use every day on your skin or hair. It does a great job for my hair. I use it daily to moisturize and treat my hair. I wish the fragrance were a little bit pleasant; It has an industrial smell, but I guess the oil is in it's pure and natural state without other products added. Do you use argan oil?